I’m sure by now most everyone in food-bloggy-land has heard The Big News about The Next Big Thing. That’s right, whoopie pies. Being from Maine and having lived here all my life, I’m definitely familiar with them. I had no idea that they were a New England thing, though. You learn something new every day I guess. I’ve never really been a big fan of whoopie pies in general. I could probably count on one hand the number of them that I’ve eaten over the course of my life. They’re generally too sticky and sweet for me, and I’d generally rather have a cookie or a piece of actual pie instead of a whoopie pie. I’d never tried making them before, though, so I figured what the heck. Plus, they’re on the Sweet 100, which I am trying to not only eat my way through, but make, too. Probably the most colorful whoopies I've ever seen. I will say that the one exception to my whoopie-disliking ways would have to be pumpkin whoopie pies – I’ve had little homemade bite-sized pumpkin whoopies around Halloween and they were terrific, but anything pumpkin is superior as far as I’m concerned, and all the better if it’s homemade, too. However, pumpkin season is a good six months away. Nice contrast there, Mr. Whoopie. Enter the matcha whoopie pie. Once again, no clue where my ideas come from. Just on a tea kick lately, I suppose. 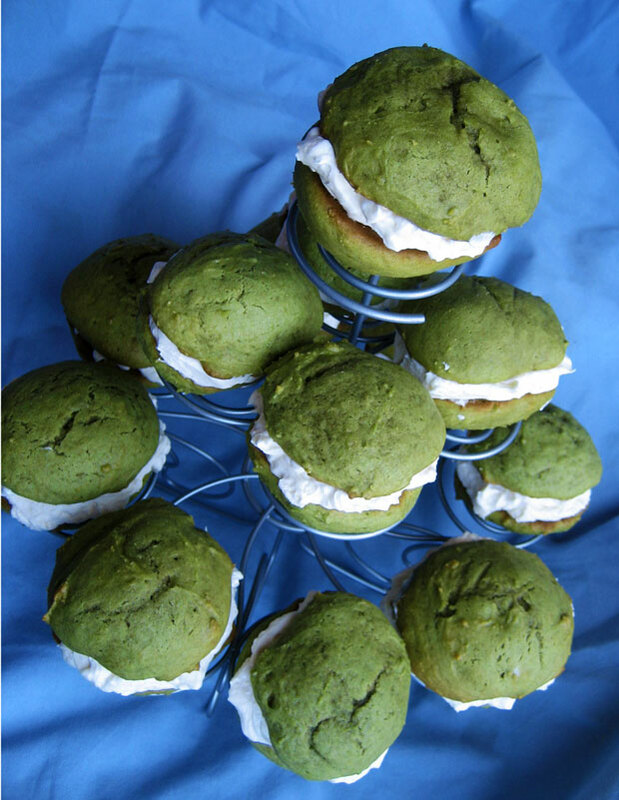 I also thought green whoopie pies would look cool. Which they totally do. I happened to have just enough whoopies to fit on my cupcake tower, so that's where they went. I think they had fun. I originally considered a fruity cream for the filling, but ended up going with white chocolate. I felt like I don’t really give white chocolate enough love. I used to adore it as a kid, but lately I’m into way dark chocolate. As in, so-dark-it-doesn’t-even-taste-like-chocolate dark. Matcha and dark chocolate are a nice pairing, but I thought I’d give white chocolate a chance. 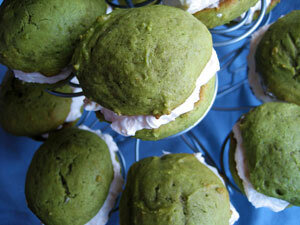 I’m glad I did, since the matcha flavor is relatively subtle and would probably get lost with a darker filling. Another thing I did with the filling (which could be considered sacrilege if you’re the kind of nut who takes whoopie pies of all things too seriously) was replace the shortening called for in most whoopie fillings with butter. I just prefer real butter these days – you don’t get that nasty coating on the inside of your mouth like you would with shortening. And I think it makes the filling much lighter and fluffier. I hear you are also supposed to use marshmallow fluff, but that doesn’t seem quite as important as the shortening. I also forgot to buy buttermilk for the cake/cookie part and ended up subbing 6 oz. of nonfat Greek yogurt and 4 Tbsp whole milk (the milk was only because the yogurt came in a 6 oz. container and I didn’t want to open and partially use another container that I didn’t plan to eat right away). It obviously didn’t hurt any since they puffed up just like they’re supposed to. The yogurt also made the batter incredibly fluffy and light. So I would recommend doing that instead of putting vinegar or lemon juice in milk if you don’t have buttermilk. Cream together the butter and sugar. Add the egg and vanilla and beat until light and creamy. Whisk together the dry ingredients. Add the dry mixture and buttermilk/yogurt alternately in thirds to the batter, mixing well after each addition. Preheat the oven to 350. Depending on the size whoopie pies you want, scoop the batter anywhere from 1 Tbsp to 1/4 cup at a time onto a parchment- or Silpat-lined baking sheet. Leava about 1″ between each scoop on the sheet. Bake 10-15 minutes, until puffy and springy when poked. Allow to cool fully before sandwiching. In a double boiler over high heat, combine the eggs and sugar (in the metal bowl of a stand mixer is perfectly fine and preferable if you have one). Whisk over simmering water until the sugar dissolves (will be about 180 if you have an instant read thermometer). Immediately whisk to a glossy meringue. Switch to the paddle attachment on medium speed and add the butter one piece at a time, waiting for each piece to be fully incorporated before adding the next. Add the vanilla, salt and chocolate and beat for one minute. Spread the filling generously between similarly shaped and sized cookies/cakes/pies/whatever you want to call them. Making these hasn’t really changed my opinion of whoopie pies – I still don’t think they could possibly be as big as cupcakes are. They are definitely fun to make, and tasty, but I don’t think they have as much room for creativity as a cupcake, which you can flavor, fill and frost in any combination imaginable. Plus I’d like to see some more mileage out of the incomparable macarons before they’re replaced by fatter, less dainty whoopie pies. 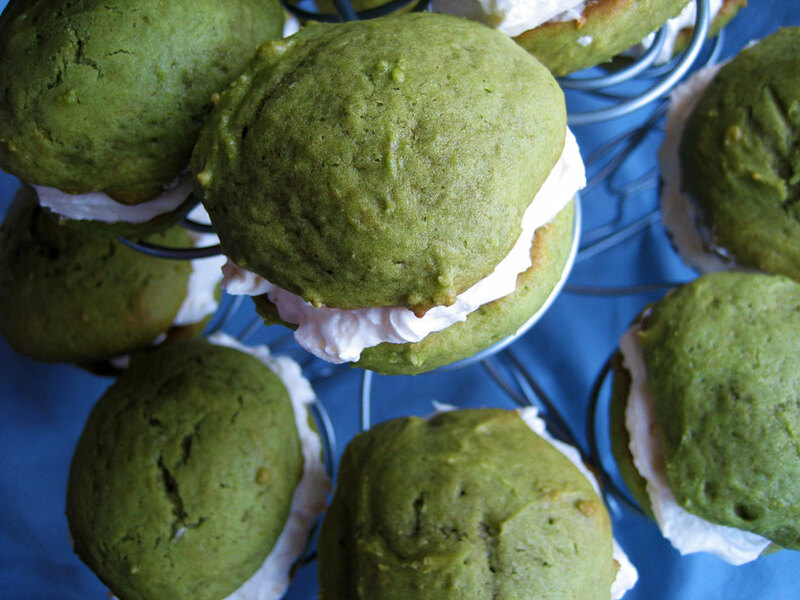 I wouldn’t want to discourage anyone from trying this recipe, however, especially if you like matcha. 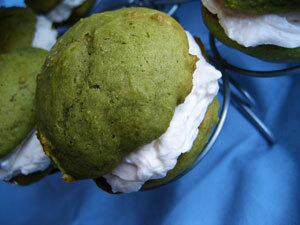 It’s a fun twist on the regular chocolate and marshmallow flavoring and a neat way to use matcha. 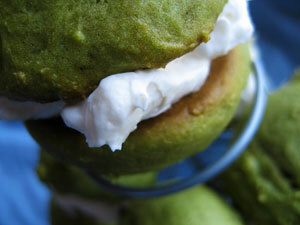 I think if I were to make whoopie pies again, though, I’d probably attempt a red velvet with cream cheese filling. I bet they’d be stunning (get to work, people, or I will…eventually). Those look excellent! I like matcha and white chocolate together. Pumpkin version sounds like a must-do as well! I bet the white chocolate was a really good foil for Matcha’s strong and pretty vegetal flavor. The pies look great — love them on the cupcake tower. I was thinking about the matcha/white chocolate combination just today! 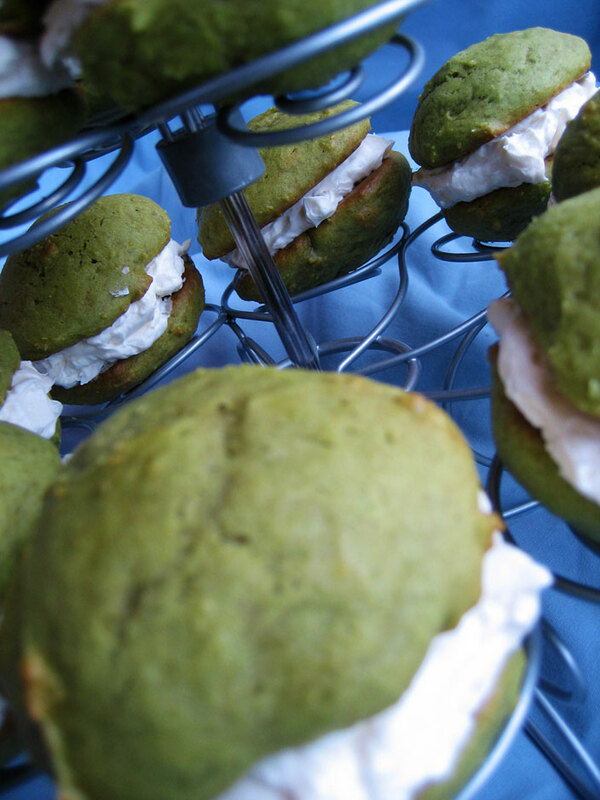 My idea was a matcha madeleine with white chocolate glaze. This looks great! This is so funny because I have been seeing whoopie pies everywhere! These sound amazing! I bet a little bit of dark chocolate would go well, too, since matcha and dark chocolate have a surprising affinity for one another. I once had matcha-coated chocolate truffles that were just awesome. blame my mom for raising me on health food.